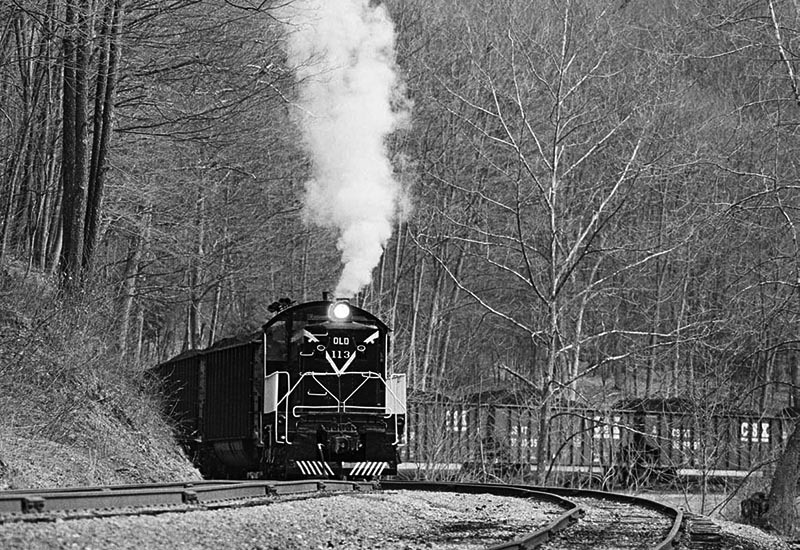 Short line railroads were once common in the coal mining regions of West Virginia, including such legendary carriers as the Buffalo Creek & Gauley, Campbell’s Creek Railroad, West Virginia Northern, and the obscure Beech Mountain Railroad. Over the years many small coal haulers have succumbed to the ever-declining boom and bust cycle of older, less productive mines left in the dust of a progressive industry striving to hoist more coal out of the ground with larger mines and fewer miners. Despite a rocky history, the Beech Mountain has managed to survive obsolescence due in part to the abundant quality coal resources remaining along its line. On February 14, 2005 the eight-mile long Beech Mountain resumed operation in the remote, hardwood-clad hills of central West Virginia after having lain dormant since 1998. This revived line once again performs the sole purpose of transporting empty cars received from their interchange at Alexander, in Upshur County, with Four Rivers Transportation (which purchased the Appalachian & Ohio Railroad from Watco on May 15, 2006) to United Coal’s Carter Roag mine at Star Bridge returning with loads destined for customers outside of this picturesque backwoods region. That this diminutive railroad has returned to life after seven years of inactivity is just the latest chapter in the history of this trail of steel that has threaded its way along the Buckhannon River on and off for over a century. The late afternoon light on February 20, 2006 reveals the intricacy of detail in sixty year-old Alco S2 OLD 113, clunking past on its way to tie on to a cut of empty CSX coal cars waiting in the interchange yard at Alexander. Unlike the handful of coal hauling short lines that gained notoriety during the swan song of steam operations, the Beech Mountain labored in relative obscurity for many years. Railroad operations began in 1890 with the construction of a narrow gauge tramway for the Alexander Lumber Company. After just two years, the line was standard-gauged and renamed the Alexander & Rich Mountain. By 1906 the railroad became the Alexander & Eastern and would operate under this title until the late 1940s when most of the track was removed and the right-of- way used as a truck road. With the abandonment of the Alexander & Eastern, the banks of the Buckhannon River lay silent to the sound of steel wheels on rails until 1953, when the tracks were re-laid using ex-Cherry River Boom & Lumber Shay No. 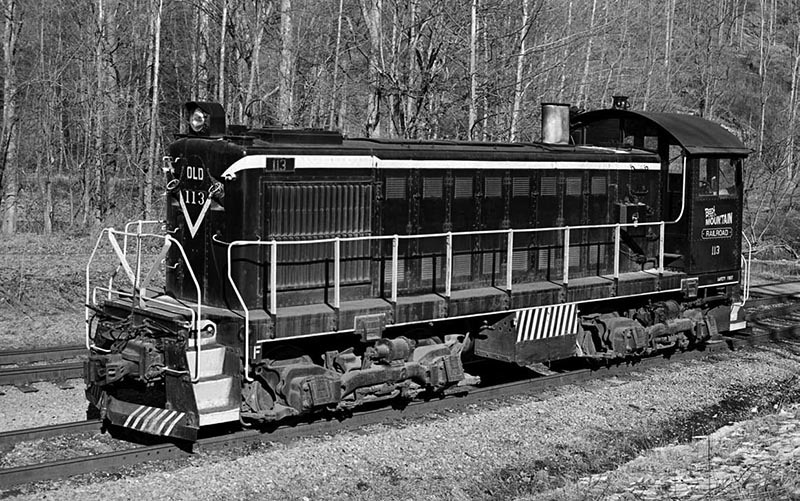 16, which is currently on display at Pennsylvania State Railroad Museum. The new operation was named the Beech Mountain Railroad (BEEM) and hauled coal from a number of mines until 1975 when successive mine closures forced the abandonment of all but eight miles of rail between Alexander and the Carter Roag Mine at Star Bridge. Over the years, Beech Mountain has been owned by several companies, including Peerless Coal, J.M. Huber, Carter Roag, and United Coal. 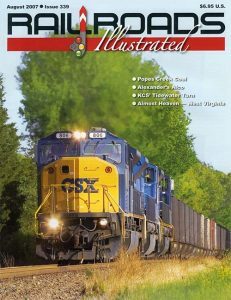 An interesting assortment of Beech Mountain diesel locomotives have toiled along the twists and turns of the Buckhannon River hauling coal to Alexander, comprising smaller units suited to tight curvature and small bridges. The first, a Whitcomb 65-tonner arrived in February 1954 to replace ex CRB&L Shay #16, and was the sole power until the arrival of a GE 80-tonner in March 1961 and finally a Whitcomb 80-tonner, which appeared in 1963. All three centercabs were off the roster by 1980, replaced by a Penn Central, ex PRR Alco, S1 No. 9452, which served until the mid 1980s. 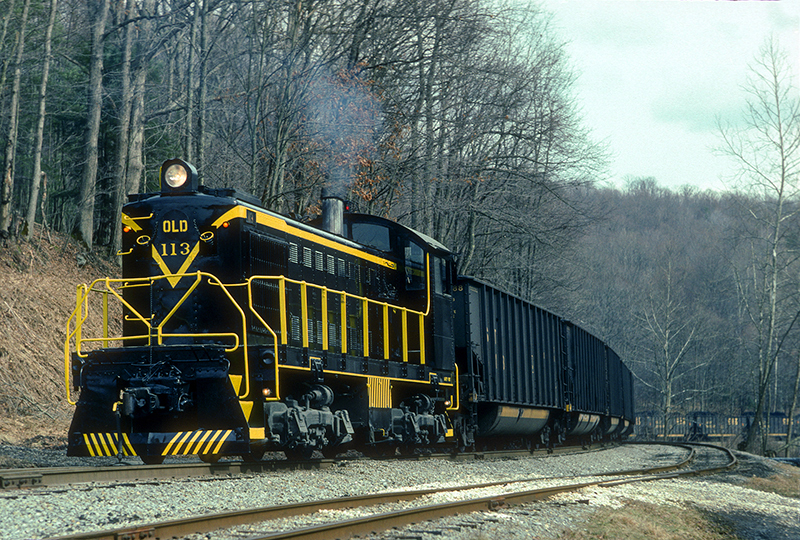 Gleaming black and yellow “Old 113” shows off its new stripes departing the interchange at Alexander, W. Va., with empty CSX gondolas on February 20, 1995. Of note is the gardening can strapped to the roof access step, with a hose running up to a holder under the sheet metal lip on the cab. During a trip to West Virginia in 1989 our affection and appreciation for one of the few remaining coal hauling short lines was fueled by the hospitality of railroad Superintendent Charles Dulaney, and by the interest of the engine and section crews. During our first encounter with Beech Mountain employees, the section gang was preparing their steel-wheel equipped GMC pickup for a day of track work while “Old 113,” an elderly ex-Michigan Limestone & Chemical Alco S2 with a high mounted headlight prepared to depart with coal empties destined for Carter Roag at Star Bridge. The former Pennsy S1 sat snow covered and silent on the dead track behind the one stall engine house. After a conversation with both crews and a visit to the cab of the idling Alco, we assembled everyone together for a group photograph on the locomotive’s walkway. Upon departure, “Old 113” rattled and shook as engineer Joseph Morgan widened out the throttle and thirty empty coal hoppers began their journey up the Beech Mountain. The section crew waved and resumed their duties. We listened long and hard as the 43-year-old switcher hit its stride departing Alexander, filling the valley with the turbocharged burble of its Macintosh and Seymour 539 engine. The Beech Mountain proved itself a true Appalachian short line in a region increasingly dominated with unit coal trains and huge coalmines. 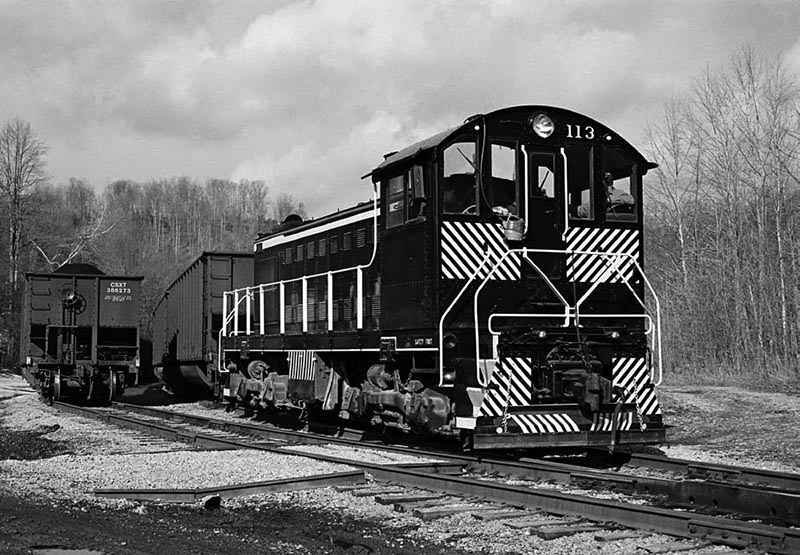 Returning to Alexander in 1995, we found “Old 113” there in fresh black paint and yellow stripes, and many of our photographs were on display in the office and in the small engine house. A warm welcome was forthcoming, which included advice on scenic photo locations and directions to the Carter Roag tipple at Star Bridge, which we followed as the Alco departed the interchange with a cut of empties. The Carter Roag Coal Co. No. 1-A Mine in Randolph County featured yet another impeccably maintained ex-Michigan Limestone & Chemical unit, Alco S4 115, and personnel at the mine allowed us to photograph the unit after we donned steel-toed boots and hard hats, and viewed the obligatory safety video. In twenty-five years of visiting Appalachian coalmines, this was the most gracious invitation we have received at any mine, ever. After a brief stop following the down hill trip from Star Bridge to release retainers on several of the head end gondolas, the engineer opens the throttle for the steep climb into Alexander yard, unleashing a thick plume of classic Alco smoke in the best tradition of the steam power that worked this remote line in years past. On the return trip from the mine with coal loads Beech Mountain’s spotless “Old 113” whistled for the grade crossing at Palace Valley and Alexander’s Alco looked quite at home under the towering hardwoods of central West Virginia. Forty-three loaded coal gondolas trailed the 1000 horsepower Schenectady graduate of September 1946. New heavier steel in the form of 131-pound stick rail had been laid on about three and one half miles of the line, and operations appeared safe. For much of the late nineties, the Beech Mountain operated on a daily basis hauling black diamonds from Star Bridge to Alexander and its interchange with CSX. Secure is not a term that can be applied to a rail line that has operated in two different gauges, been renamed six times, and ripped-up in the late 1940s, only to be re-laid by 1953. Often during the sixties and seventies, the Beech Mountain sat inactive, running only sporadically if at all. It seemed as if, back in March of 1998, the BEEM might have played out its final cards. The rails along the Buckhannon River grew rusty and the sound of struggling coal trains no longer competed with the rushing waters of the Buckhannon River. The authors wish to thank Ron Stafford for graciously contributing information for this story.